• After un‐packing the Utility Rack or Water Tank, fasten the holding bar (1) with the four M6 flat head bolts to the top section of the mounting area, creating a rain gutter hook. 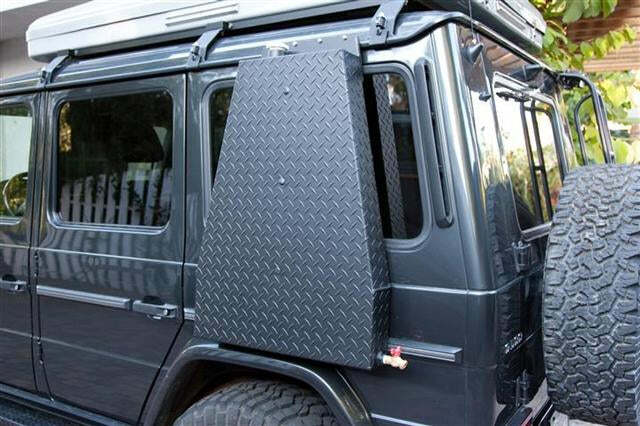 • Carefully take the Utility Rack or Water Tank and hook it into the rain gutter at the right or left side of your G‐wagen. Move it into the position of your liking and mark the gutter on both sides with blue masking tape. Make sure the tank filler door of the vehicle is not obstructed (W463’s). • Remove the Utility Rack or Water Tank from the gutter. • Loosen the four M6 Flat‐Head screws on the top of the Utility Rack or Water Tank approximately by 5mm but do not unscrew them completely. • Fold and form the included foam protection pad into a “S”‐shape and slip it over the rain gutter between the two markers (blue masking tape). • Insert the Utility Rack or Water Tank now carefully with its “Gutter Hook” into the open fold of the protection pad and pull the rack downwards into the gutter. • If the rack is in the correct position and sits tightly down in the gutter fasten the four M6 Flat‐Head screws of the hook bar lightly. 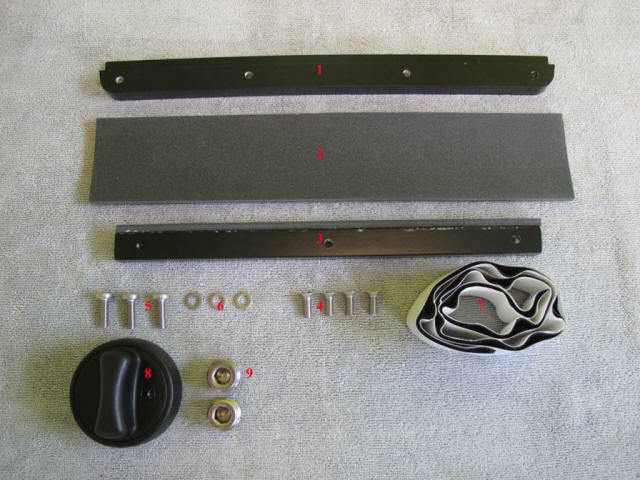 • Position now the clamping bar from behind with the foam side facing against the rain gutter and insert the three M6 Pan‐Head bolts together with the three 6mm washers. • Tighten these bolts while pushing the clamping bar upwards against the underside of the rain gutter. The use of a small screwdriver or similar tool as a lever might be necessary to clamp the Utility Rack or Water Tank securely onto the gutter. • Fasten now the top four M6 Flat‐Head screws completely. • Clean the existing quarter panel molding and install the self‐adhesive Velcro onto the molding behind the Utility Rack or Water Tank. • Match that position and install the other self adhesive side on the backside of the Utility Rack or Water Tank. • Locking the Velcro strips together completes the Utility Rack or Water Tank installation. Please see the new “ no-drip “ fuel connection for the fuel tank use. • When no more fluid is observed in the clear hose, remove the hose and fitting from the quick connector at the tank, before removing the hose end from the fuel filler neck.